Elisa Brown is driving home after visiting the grave of her eldest son. Her car is old, and there is a crack in the windshield that she never got fixed. Suddenly, the crack disappears. Elisa finds herself driving a much newer car, wearing clothing she never would have chosen for herself, in a body that is hers… but different. These are not the only things that have changed. She has absolutely no idea what happened or how to fix it. The main character in this book is an unreliable narrator. She doesn’t know what happened to her, or how it happened, or what caused it. This leaves the reader to try and fit together a puzzle without being given all of the pieces. This is not a complaint. One of the things I enjoyed about this book is that it provided a curious mystery for me to ponder. Has Elisa fallen into an alternate universe? Did she suffer a nervous breakdown and lose track of reality? Is it all a dream? At first, Elisa is very confused as she notices that many things have changed. She has a different job than before – one that appears to involve going to conferences. She figures out that she and her husband had been – and are still going – to marriage counseling. Elisa cannot remember the reasons why they are doing that. Obviously, that gets in the way of whatever progress they may have made. The most shocking change between the world she remembered and the world she found herself in is that her deceased son is still alive. Elisa decides to try and find the missing pieces that would help her understand what happened. She goes online and searches for information about parallel universes. Her desperation to make sense out of things eventually causes her to behave in ways that make it clear she has lost her grip on reality. The story presents unstated questions to the reader. What would you do if you suddenly found that the world was much different than you remembered it being? How would you react to familiar people who behave differently towards you than you have come to expect them to? How do you talk with a stranger who believes she is your best friend? How do you save a troubled marriage when your spouse looks (mostly) the same but exhibits a somewhat different personality? Do you even want to try? How do you cope with a deceased loved one who is now very much alive – and who wants nothing to do with you? I’m leaving a lot of the details out in order not to spoil things. This is a story with no clear solutions or answers. It is largely up to the reader to figure out for themselves what happened to Elisa. The ending provides readers with more questions than answers. Something significant happens, but the reader is not given the results. Readers may come away from this story with an uncomfortable question about how much of their reality is real. 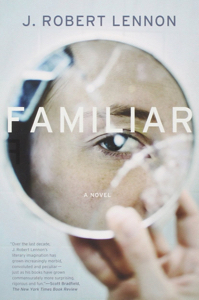 Familiar – by J. Robert Lennon is a post written by Jen Thorpe on Book of Jen and is not allowed to be copied to other sites.